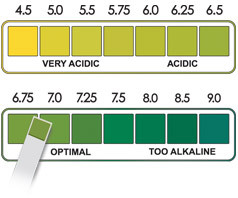 Super-sensitive pHion Diagnostic pH Test Strips give you an extremely accurate reading of how acidic or alkaline your tissues really are. How do you measure what's going on inside of your body? By analyzing what it's secreting: urine and saliva. Due to the action of the kidneys, the body is constantly trying to rid excess acids through urine, which can range in pH anywhere from 4.5 to 8.5. The pH of urine is a good reflection of the pH of your internal environment. Another way to monitor the overall pH balance is to test the pH of saliva. 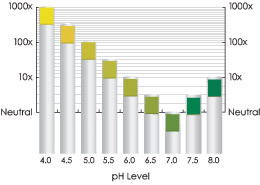 Saliva pH can range anywhere from 5.5 to 7.5 or more. 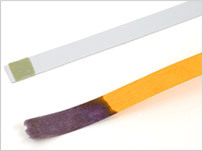 With sufficient alkaline minerals, saliva should register a nice 7.0 to 7.5.
pHion Diagnostic pH Test Strips are the best on the market, and you can see the difference between pHion test strips and litmus paper in the image below. The pH scale is 0 to 14 and, as you can see below, the pHion one pad test strips are easy to read and very accurate.